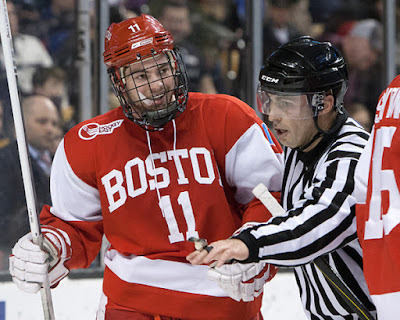 BU Today spoke with senior assistant captain Danny O’Regan about playing in his final Beanpot Tournament. O’Regan scored the double-overtime game-winner in last year’s Beanpot semifinal against Harvard. (video) The San Jose draft pick and his father, Tom O’Regan, who co-captained the 1982-83 Terriers, are the only father and son duo to each score 50 goals in Division 1 hockey. It’s also the final Beanpot for senior Mike Moran who spoke with the Patriot Ledger about the tournament. Last year Moran scored BU’s first goal in the championship game won by the Terriers in overtime, 4-3 (video). ● Beanpot Watch Parties in 14 cities organized by BU Alumni. 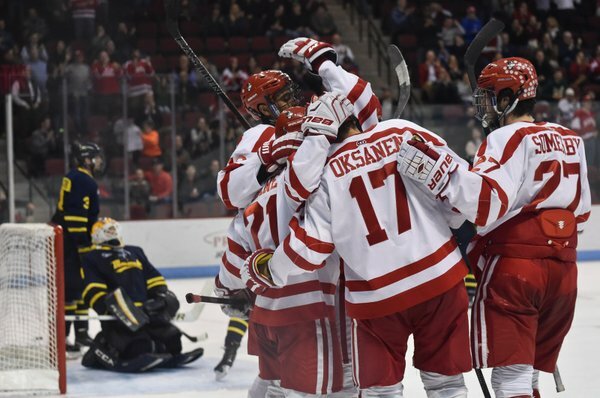 ► Following Friday’s 4-0 win against Merrimack, BU is #8 in the PairWise Rankings. There are five Hockey East teams among the top 11. Former BU standout and NHLer Ryan Whitney, is launching a hockey podcast together with Bruins’ blogger “Rear Admiral” on Barstool Sports. Whitney recently authored an article—Tales From Abroad: Russia— on his experiences playing in the KHL for The Players Tribune. 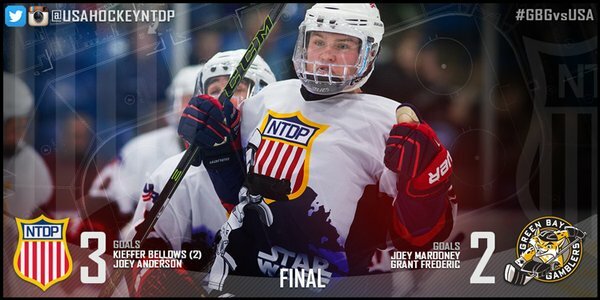 For a second consecutive night, 2016 recruit Kieffer Bellows scored twice—including the game-winner—and added an assist to lead the NTDP U18s past Green Bay. The Edina, Minn., native’s second goal of the game—and 33rd of the season—broke a 2-2 tie midway through the third period. Fellow 2016 recruits Chad Krys and Clayton Keller each had an assist in the win. ● 2018 recruit Jack DeBoer (photo) earned first-star honors, scoring a goal and an assist in the Salisbury School’s 5-3 win against The Gunnery. 2019 recruit Joel Farabee scored twice in Selects Academy’s 4-2 win over the Syracuse Stars and had a goal and three assists in an 8-0 blanking of the Providence Capitols. The speedster from Cicero, N.Y., is second in scoring in the USPHL’s 16U division with a 10-20-30 scoring line in 17 league games. Junior defenseman Alexis Crossley (photo) scored a pair of goals—one each in the early minutes of the first two periods—in the Terriers’ 6-2 win over Merrimack at Walter Brown Arena. All three members of the Kayla Tutino-Sarah-Lefort-Victoria Bach line also found the net as did Sammy Davis. #9/10 Terriers picked up their third straight conference win, blanking Merrimack, 4-0, at Agganis Arena behind goals by junior Robbie Baillargeon and seniors Danny O’Regan, Matt Lane and Ahti Oksanen. Senior Sean Maguire stopped all 27 shots he faced, but wasn’t credited with either a shutout or a win. Just over one minute into the first period, he had to leave the game for skate repairs, and was replaced by sophomore Connor LaCouvee, who made just one save in his five minute-and-49 seconds relief stint. During that stretch Baillargeon completed a pretty passing play, ripping home a Lane feed from the left faceoff circle dot for what proved to be the game-winner and the only goal in a penalty-filled opening period. 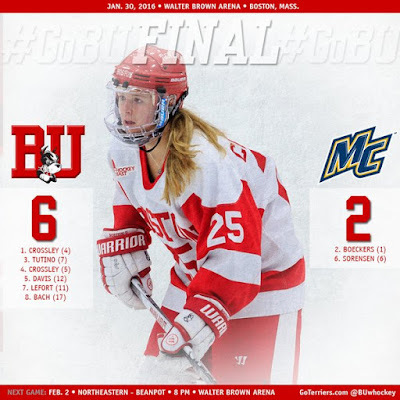 Merrimack had four minutes of power play time in the second period, but it was the Terriers who found the net as O’Regan stole a pass in the center zone, broke through two defenders and scored a shorthander that gave BU a 2-0 lead. In the third, BU’s current goal-scoring co-leaders both struck: Lane converting his own rebound and Oksanen, whose empty-netter was his 50th career goal. Both have a team best 14 scores this season. 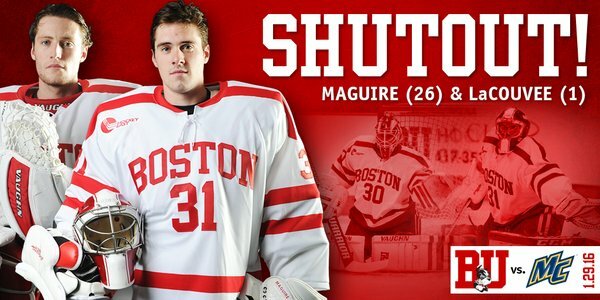 Maguire made several difficult saves late in the game, along with 10 power play saves, to preserve the team shutout. While Maguire wasn't credited with the win or a shutout, he did earn first-star honors for yet another strong performance. O'Regan and Brien Diffley were the second and third stars. Diffley assisted on the Baillargeon and Lane goals for his first multiple-point game this season. In the final minutes, Captain Matt Grzelcyk passed up several opportunities at the empty-net to set up shots for Lane and Oksanen. In the third period, O’Regan nearly duplicated his goal, breaking through the Merrimack defense again, but was denied by the Warriors’ Collin Delia. 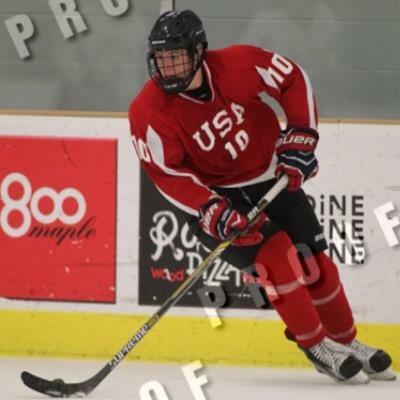 2016 recruits Kieffer Bellows and Clayton Keller both scored a pair of goals in the NTDP U18s 4-3 win over Green Bay. Bellows, who assisted on Keller’s first goal, delivered the game-winner on a wrap-around in overtime—his team leading 30th score and sixth game-winner this season. Chad Krys assisted on Keller’s second goal and netminder Jake Oettinger stopped 26 shots to gain his 17th win. ►Tonight’s rematch between the U18s and Green Bay is available in HD online for free. 7 p.m. ET. 2016 recruit Dante Fabbro scored a goal and added an assist in Penticton’s 6-1 win against Trail. The right-shot defenseman now has 50 points (11G, 39A) in 34 games for the BCHL’s league-leading Vees. Terriers take on Merrimack at Walter Brown Arena Saturday in a 3 p.m. start. 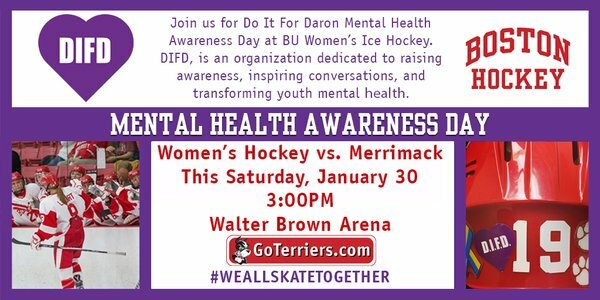 Saturday is the Terriers' second annual "Do It For Daron Mental Health Awareness Day." DIFD is an organization dedicated to raising awareness, inspiring conversations and transforming youth mental health. BU is unbeaten (3-0-1) in its last four conference games. Sports journalist Jashvina Shah interviewed former BU standout and Olympic gold medalist Jennifer Wakefield, who now plays in Sweden’s top women’s league.